The Diversity Project is a cross-company initiative championing a more inclusive culture within the Savings and Investment profession. We believe that we have an extraordinary opportunity to press the re-set button in our industry: to recruit, nurture and retain the first truly diverse generation of Savings and Investment professionals. Our businesses will better reflect both society at large, and the individuals who trust us with their money. Our people will create better financial outcomes to benefit our diverse savers and investors. We will attract more interest in the industry, with a pipeline of diverse talent. Diversity is not only our social obligation, it’s a business imperative. Please join us, and help campaign on the diversity issues that matter most to you. A truly diverse and inclusive UK investment and savings industry with the right talent to deliver the best possible results for our clients and to reflect the society we serve. We believe that recognisable and measurable progress can be achieved over the Project’s five year timeframe. We aim to achieve diversity across all dimensions, including gender, ethnicity, socio-economic background, LGBTI+, age and disability. Metrics to assess progress will be published following an analysis of the industry’s existing position across these dimensions. The purpose of the Diversity Project is to accelerate progress towards an inclusive culture in the investment and savings profession. Such a culture across all levels supports more effective teamwork, gives wider perspectives, better investment decisions, better results for our clients and ultimately more sustainable businesses. The Project spans the whole range of the profession: asset owners, fund managers, fund selectors, pension consultants, actuaries, trustees, wealth managers and the professional standards and trade bodies. 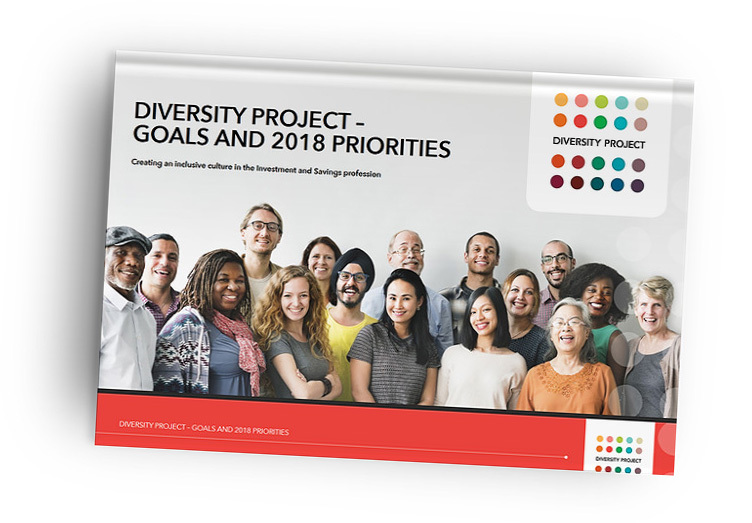 The Diversity Project approach is holistic, collaborative and open source. We listen, not prescribe. The Project is complementary to individual firms’ initiatives – we believe that joined-up efforts can yield greater results. We work collaboratively with existing initiatives, such as Investment 2020 among others. We aim to achieve the vision through a concerted, collaborative and cohesive action plan. We will share best practice, and where there are gaps establish new ones to help create a more diverse industry at all levels from intake to senior leadership and the board. We do not duplicate efforts that are already working, but seek to amplify existing initiatives through a joined-up and intensive approach with a sense of urgency. We seek to deepen the understanding and image of what the investment industry actually does and the varied roles within it, to encourage a broader range of new entrants. We offer networking and mentoring opportunities, to develop and retain existing diverse talent. Creating an inclusive culture in the Investment and Savings profession. Our poster highlights what the Diversity Project has achieved to the end of 2018. We encourage asset and wealth management and investment consulting firms to make 10 commitments. We have created a self-assessment form for organisations to use when assessing their progress. We have developed a number of focused work streams and these continue to expand. The Project is overseen by a CEO/Chair Advisory Council, which provides strategic input and business leadership. A Steering Committee leads the implementation of the strategy, through specific work streams. There is a further group of Individuals and Ambassadors, members from all levels of the industry, who help deepen the work through individual engagement. In all cases, volunteers are driving change. There are five ways to get involved. At a business level - through declaring your firm’s support, providing volunteers, expertise and/or a donation to help fund the work. CEO/Chair Advisory Council - individual leaders who are committed to the goals and can influence their businesses. Steering Committee - suitable for those who are willing to devote time and effort to developing and leading workstreams, and who are at a sufficiently senior level to represent their firms. Workstream participation – suitable for those who are willing to get involved in specific efforts and who may be at any level in their organisation. Ambassadors – individuals who are prepared to offer time and expertise to help with speaking at schools, universities or business schools or who may wish to host networking events or mentor. Please email us at: [email protected] if you would like to help.